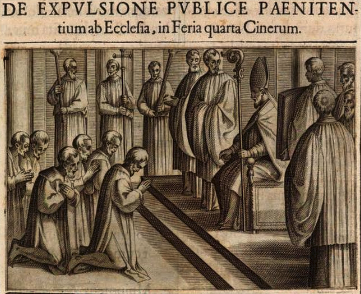 There is perhaps no church in France where public penance is observed with more exactitude and ceremony than in the church of Rouen. The remains of this ancient discipline are too beautiful to overlook here. Here follows an account of how it is practiced in this church. We commit all sorts of persons to public penance here: men, women, and young people. Since the beginning of this year I have obliged two young men of twenty or twenty-five years for having spoken several blasphemies in the presence of several people of their parish with whom they were working. The crimes for which people are ordinarily obliged to public penance are: the smothering drowning, or burning of children with significant negligence of their parents; public concubinage, horrible blasphemies that cause scandal, etc. From several places in the diocese I hear of what sort of satisfaction was performed by gentlemen who fought inside churches. They find me in my chapel on the day and hour prescribed. Those who come from farthest away arrive on the previous day at Vespers usually carrying letters from their parish priests that attest how they have fulfilled what was prescribed for them. For penitents from the city, usually I make them hear their parish Mass ad fores interiores ecclesiae since the portals of the churches are usually next to the road. In this way they are still noticed, when ladies in silk veils or scarves leave their pews to hear Mass or the Divine Office from the church door. On Wednesday morning the archbishop’s sermon is given in the pulpit at the end of the nave very near to the door of the choir. Subsequently, this same pulpit is removed, with a particular ceremony, into an arcade near to the main portal, so that the penitents who cannot enter the church with the others to assist at the Divine Mysteries may still at least hear the word of God during Lent. Thus on Ash Wednesday the archbishop, in pontifical vestments, or in his absence the head of the chapter, goes into the choir to bless the ashes and impose them on the clergy. 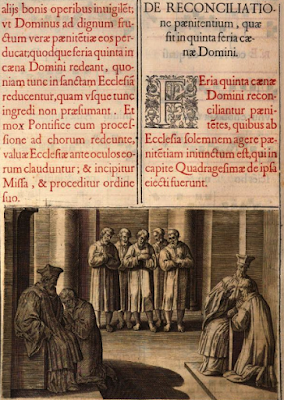 After reading this Lesson, or rather exhortation, the archbishop or officiant sits on a faldstool prepared for him on the right side of the clergy. Then one of the beadles comes from my chapel (of John the Baptist) where the penitents wait, each of them holding a lighted candle. He leads them through the people, who have assembled in great number for the ceremony. They pass through all the clergy to prostrate themselves on their knees before the seated officiant who blows out their candles. Then they go in the same order to the main door of the church which is half-open. After they have left one after the other, I accompany the archbishop or officiant to close the door with him when the last penitent has left. Then we go to join the clergy, where I take my place and return in procession to the choir, where Mass is celebrated. The penitents of Ash Wednesday, and others who have been referred during Lent, go on Absolution Thursday at 8 in the morning to the chapel of the penitentiary in the Cathedral. They bring back the candles that had been extinguished on Ash Wednesday. After None has been celebrated, the clergy come in procession into the nave led by the archbishop in pontifical vestments, or in his absence by the first member of the choir, who takes this properly archiepiscopal day as well as Ash Wednesday. The deacon reads the Lesson that begins Adest, venerabilis Pontifex, etc. 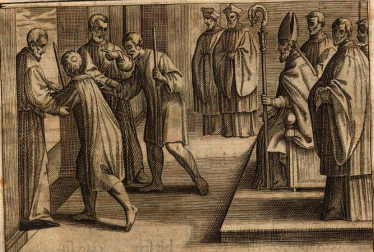 which contains a request made by the deacon to the bishop in the name of all the faithful and the whole church, to reconcile the penitents and give them the grace of absolution that the Church asks for them with humility, and of which they have made themselves worthy by their continual tears and groans, by their fasts and other exercises of penance. 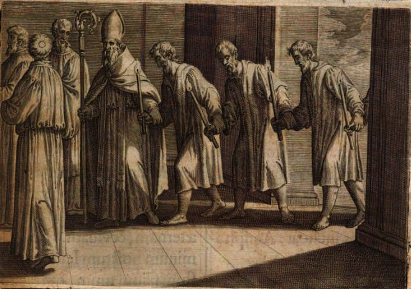 While this Lesson is chanted, the beadle comes to take the penitents and lead them outside the church to the main door from which they were expelled on Ash Wednesday. The archbishop or officiant begins the Venite, which the clergy repeat alternately three times, and ends with Venite filii, audite me, timorem Domini docebo vos. 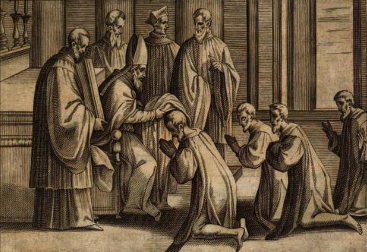 Then the main door is opened to the penitents who prostrate themselves one after the other before the archbishop or the officiant, who gives them the kiss of peace. Meanwhile the deacon and subdeacon take the extinguished candles of the penitents, light from from those carried by the acolytes, and give them back to the penitents who go in a line through the clergy to a small area prepared for them in front of the pulpit at the top of the nave, as on Ash Wednesday, where they hear a sermon made by the Penitentiary or someone else appointed to do it. The clergy and a great number of people assist at this ceremony and are very edified by what takes place in this ceremony. 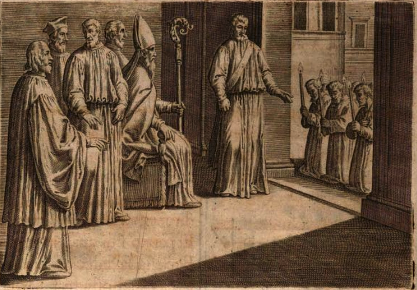 After the sermon, which the penitents hear on their knees, candles burning in their hands, the cantor begins the Domine ne in furore and the clergy present continue in alternation the seven Penitential Psalms, after which the archbishop or officiant, preceded by two acolytes with their lighted candles mounts the pulpit to give the general absolution as prescribed in the Manual [pg. 293]. Then the penitents return to the chapel of the Penitentiary who sends them away in peace after a word of exhortation. As for the number of penitents, I remember that I presented about forty of them to the archbishop last year. In 1697 there were twenty-eight public penitents in the Cathedral church of Rouen.